Alright, I nearly cancelled my Verizon Wireless Galaxy Note 3 because of the breaking news yesterday that the Note 3 from the EU and the US are regionally locked in. Well, it certainly ticked off a lot of users. But there is an out. 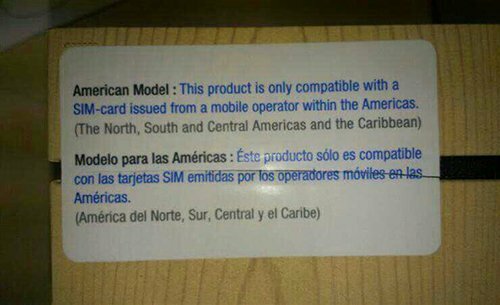 So long as the Note 3 that you bought is first activated a sim card in the region in which it was bought, the regional lock will be released. And it's not only the Note 3 but also the Note 2 as well as the S4. It's insane that this is happening. Makes zero sense that Samsung would do this. You have to believe that the carriers are behind this but Samsung is probably all too happy to oblige. Found this pic on Twitter. Not sure how authentic this is or even if it applies to the Note but it makes a lot of sense. I may yet cancel my Verizon order because of this. I'm hoping that pressure of Android users will for Samsung's hands. In fact, I'm hoping competition pressure will speak loudly. There are alternatives to the high end Galaxy line. Just as we never apologize for Apple, Google, or Microsoft, no one, including Sammie, should either. This is especially true of we are loyal long-term customers of these carriers or bought the phones outright.